A Blind Spot Monitor works by using sensors to detect for when vehicles move into blind spot zones. 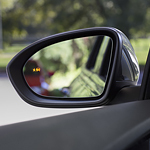 When the sensors detect a vehicle in your blind spot, you will be provided with a visual alert, which will typically appear on the side mirrors of your vehicle. There are some systems that also alert you with an audible warning to let you know it isn't safe to change lanes. According to the IIHS, Blind Spot Monitors can reduce lane-change collisions by 14% and lane-change collision injuries by 23%. About 9% of newer models offer a Blind Spot Monitor as a standard safety feature, and 57% of vehicles offer it as an available safety feature.